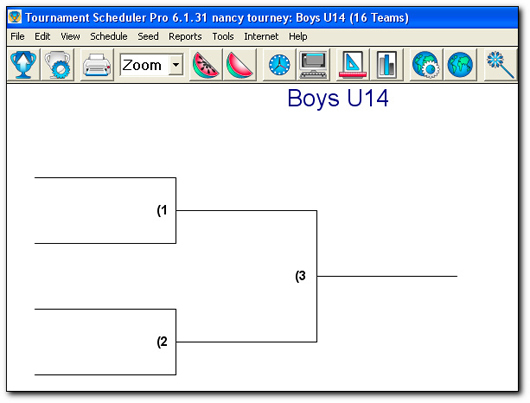 The left to right icons on the toolbar are Open Tournament, Tournament Setup, Print, Zoom, Seed, Clear Seeds, Game Times, Compute Schedule, Chart Layout, Options, Internet Options, Publish Tournament, Scheduler Wizard. 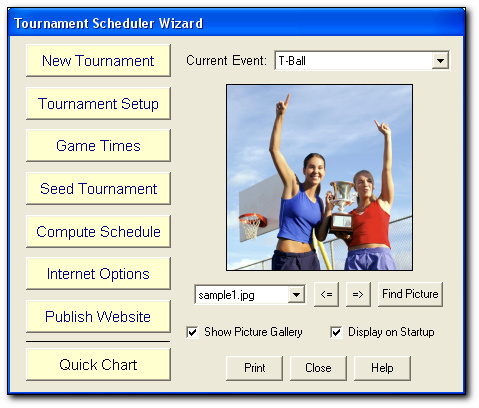 The Scheduler Wizard contains all the options you'll need to create a new tournament, add game times, seed your tournament, or create a blank chart by selecting Quick Chart. Display a picture of tournament players in the picture gallery window. Tournament Setup is where you add events, locations, teams and players. You can create multiple events for a tournament (e.g. Pool Play followed by a Single Elimination). 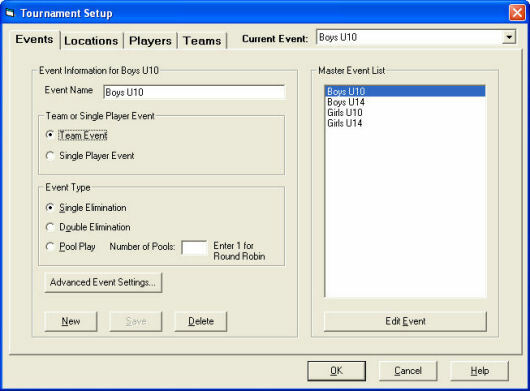 Assign locations, teams and players to each event. 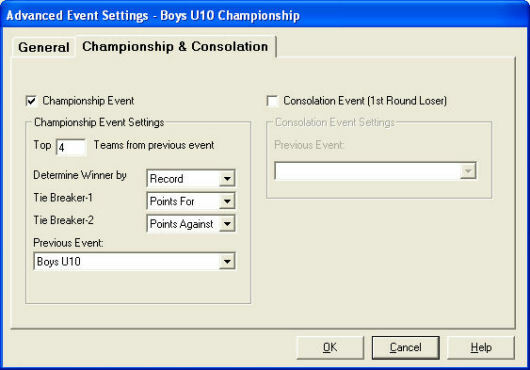 In the Advanced Tournament Settings you can create Consolation and Championship events. For Championship Events, specify the number of top finishers to automatically advance when the previous event is finished. Click Seed Tournament to seed the teams. If you have not entered seed numbers, teams are seeded randomly. If you have entered seeds, teams are seeded based on the seeding method. The default seeding method is Advantage (gives advantage to top seeds). To change the seeding method, select Seeding Method from the Seed Menu. You may also manually seed teams. Enter game time availability for each location. 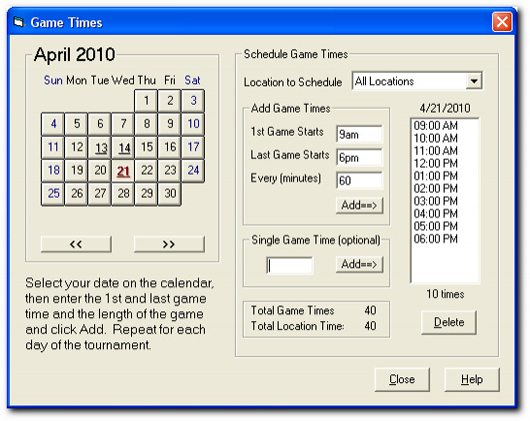 Click Compute Schedule on the Schedule Wizard screen and to automatically assign conflict-free game times to each game. View and print the Schedule Report to easily track location usage. You can sort on any of the columns shown. Click on any game number or set of brackets to view the Edit Game window. Winners are automatically advanced to the next bracket. 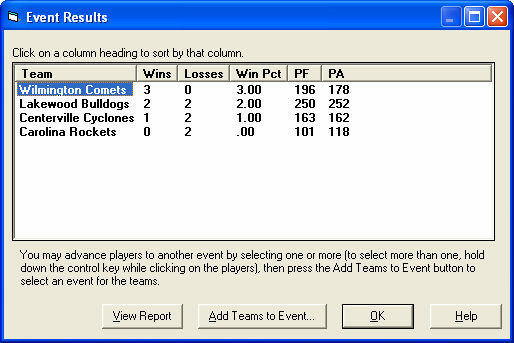 View and print the event results at any time to keep track of standings. You can sort on any of the columns shown. 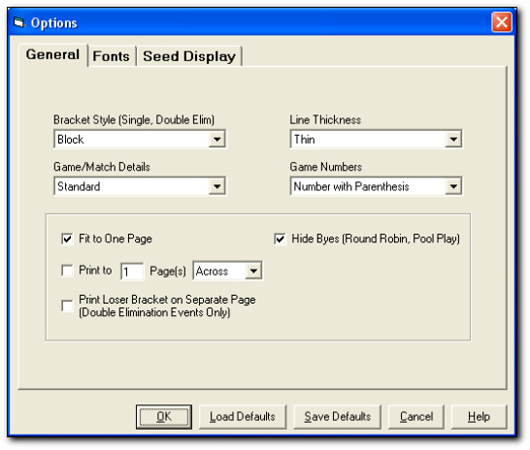 The Options screen allows you to choose the bracket style, bracket line thickness and other setting to customize the way your tournament appears when printed. The fonts tab allows you to specify the fonts and font color for different portions of the tournament chart (e.g., title, player/team name, game location). Included in your purchase of Tournament Scheduler Pro is your own free tournament website. 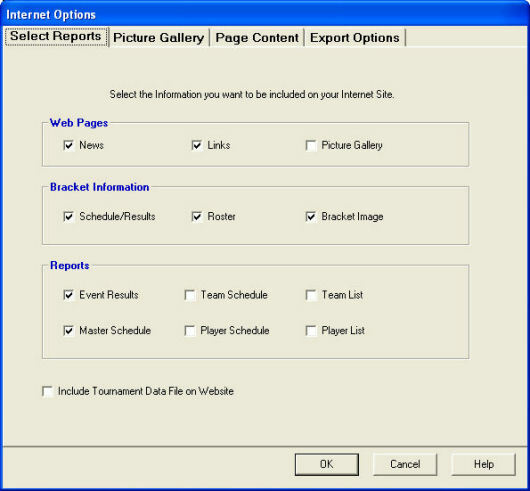 The Internet Options screen is where you select the reports and pictures to include on your website. Use the Page Content tab to enter custom text. Click on the Publish icon to create your tournament website. 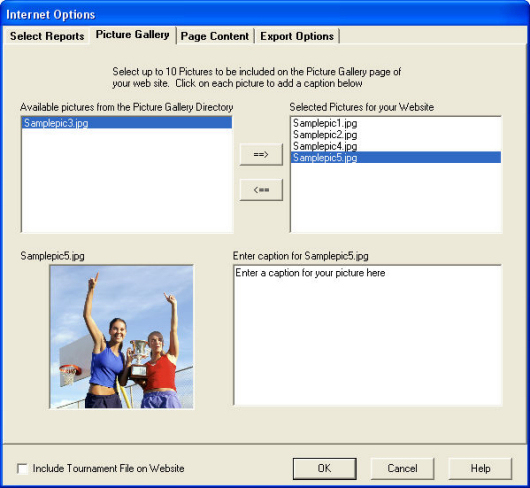 The Picture Gallery tab allows you to select up to 10 pictures and captions to display on your tournament website.